Did RBS Hit the Greece Election Eurogeddon Bank Holiday Panic Button by Mistake? RBS Bank and its subsidiary Nat West have effectively been closed all week to all of their customers, freezing them out of control of day to day banking operations. The shutdown appears fairly complete, with thus far RBS being unable to get the system going again. Meanwhile representatives of RBS have been busy reassuring customers every day that their systems would be up and running soon, soon now means next Monday. RBS blames the shutdown on a minor computer glitch. However this so called computer glitch highly dubiously coincides with the high risk of eurogeddon following the weekend Greek elections. All year (and beyond) I have been warning that in the face of financial armageddon emanating out of the euro-zone that the Bank of England would effectively shut-down the banking system rather than face a trillion pound electronic run on the banks, thereby announcing an extended bank holiday that could run into several weeks if not a whole month. Such a Panic Button hitting Bank Holiday would resemble what has transpired with Nat West and RBS all week in that it would freeze customer bank accounts until the Treasury and Bank of England had re capitalised the bankrupting banks after the contagion impact had been fully evaluated. In this respect to counter the fallout on the economy, I had speculated that the Bank of England had already printed actual bank notes by the container load and distributed them across the Banking system that the closed banks would oversee the dispersion of in line with the withdrawal limits already in place that typically restrict withdrawals to no more than £300's per day. I expect the UK government would nationalise the bankrupting banks either in part or full as they did with Northern Rock, Lloyds and HBOS, for if depositors in any significant number actually started to lose any of their deposits then that would result in a catastrophic loss of confidence in the UK financial system and spark runs on all banks. My best minimum advice is to prepare for the worst rather than leave it to chance, because if the government is facing a bank rescue bill that runs in the trillions it may decide that the pain of closing the banking system for a few weeks (Extended Bank Holiday Month) is better than the implications of more than doubling the national debt which would make George Osbourne's £140 billion annual deficit look like peanuts. A closure of the banking system (Bank Holiday Month) will result in a huge drain on cash in the economy, therefore I suspect the Bank of England has already secretly prepared itself for this eventually by printing a huge quantity of actual bank notes by the container load, ready to ship out as soon as the crisis bites, which would be necessary to cover a closure of the banking system the effect of this would be highly inflationary, because printing actual bank notes is the same as that which happened during Weimar Germany sparking hyperinflation when people ended up buying loafs of bread with Wheel barrows full of worthless currency, this is what would happen, inflation would go through the roof, forget 5% per year, we would be at 5% per month! So a closure of the banking system would probably not be the worst of what could follow as I will elaborate upon in my next in-depth analysis, ensure you are subscribed to my always free newsletter to get this in your email in box. RBS is a bankrupt bailed out tax payer owned and supported bank where this weeks false panic shutdown shows it's lack of competency and why it should have been allowed to go bust and restructured back in 2008, because all the promises for compensation that RBS is making today will ultimately be paid for by tax payers, which is why it, along with HBOS / LLoyds TSB, HSBC and Barclays were downgraded within the past 24 hours by the Moody's ratings agency in recognition of contagion risks (though at least 6 months behind the curve). In response to customer outrage, the Bank has been forced to keep most of its branches open until late in the evening to hand out cash to customers, just as was planned would take place during Financial Armageddon. This weeks RBS shutdown highlights the fact that people need to start thinking of functioning outside of the Banking system such as by utilising payments systems such as Pay pal which do not take 3 clear working days to transfer funds but do it instantaneously ! I can imagine that many of the energy and utility providers that operate sophisticated online payment operations would not require much tweaking of systems to become full fledged transaction processing systems between third party thereby bypassing the official banking system. The bottom line is that the Bank of England primarily serves its bankster brethren, instead of seeing to the windup of bankrupt banks it has been busy transferring their bad debts and liabilities onto the backs of tax payers, and the reason why the government does not take action against the Bank of England and bankster's is because it relies on them to monetize its debt so that the party in power can use deficit spending (borrowed money) to buy votes, i.e. the Government gets the Bank of England to print money (QE) that it loans to the Banks at near zero interest rates who then finance the £120 billion annual budget deficit by buy Government bonds at a higher interest rate and therefore make huge risk free profits on the interest rate differential that they bank as bonuses. The price paid by the bulk of ordinary people for the continuous money and debt printing merry-go-round is INFLATION as illustrated by the CPI Index. What I don't get is if we are into the realms of money printing, perhaps to the extreme as you've written about here, why would you not put a much larger chunk of your holdings into oil companies and other index linked funds for protection? Surely that makes more sense from an inflationary standpoint, especially if the danger is extreme. Otherwise your cash stands to lose a lot of value if pessimistic events pan out. Because the stock price oscilations around the Inflation mega-trend can be as high as 50% or more! Since March 2009 many stocks have doubled, whilst inflation has been about 15%. 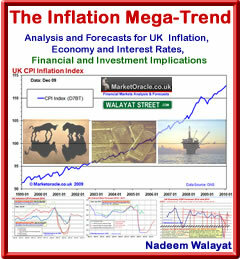 Because stock markets are subject to sentiment, wheras Inflation is, well the mega-trend. 23 Jun 12, 08:03 Bank Fragility? I was wondering the same thing. Might just be coincidence this 'technical issue' is occurring around the same time that a bank in Italy (whose name escapes me and it was not reported at all by the MSM, strangely) was unable to meet withdrawals and had to freeze customers' accounts. And of course the downgrades from Moody's. I think all the UK banks downgraded are owned by RBS and we all know what a disaster zone that is. I'm concerned this may not be so much of a 'technical issue' but rather a 'liquidity moment' - a tremor that precedes an earthquake. I hope I'm just paranoid, but I'll be moving any money I have with these banks out on Monday morning nevertheless. I hope no one else follows suit, though, I really do. You have got me interested in the UK housing market with your articles over the past six months. I have question with regards to BoE base rate. Given the situation as you see it, what do you reckon the base rate would be over the next 5-8 years? To get the economy moving the BoE would have to keep it low. However, growth with low base rates will lead to high inflation. To protect the value of the pound, rates would have to rise. Given the contradicting scenario, what do you forsee happening. Following on from that, would it be better to go for 5 years fixed motgage rate(which is higher) or to go for the tracker (which is lower but leads to uncertainty)? Your work is much appreciated and held in high esteem. I have learnt much from your articles/website over the last 2-3 years. One of the biggest things I have learnt is to be curious and ask questions as a diligent student. Re: Your comments about paypal - how safe/secure do you think Paypal is. I read at any one time they have something around 100 million dollars balance (customer's positive balances). If there is a financial meltdown, that's a considerable amount of money to keep safe. Presumably that sort of amount has to be kept in the markets. "The price paid by the bulk of ordinary people for the continuous money and debt printing merry-go-round is INFLATION as illustrated by the CPI Index." I see the cost to society in general much bigger than just fudged CPI numbers :) It has been noted that Banking creates inequality, it creates the haves and the have nots. If everything was free we'd all be rich! I condsider the root of all evil as being the public sector and welfare state, it acts like a cancer that eats the econcomy alive. We have waste swaiths of the UK either permanently on benefits or where as much as 70% of workers are employed by the public sector. Britian CANNOT recover until there is a real effort to put these people to productive use. As an example NHS GP's most of the time just go through the motions of providing a health service without actually providign one of any real value, though at heavy tax payers expense! The smart people know the government will print money / debt to pay for the unproductive so leverage themselves to the inflation consquences. And the welfare state IS EVIL, the public sector is EVIL, because it effectively turns those that could have been productive into non productive zombies that waste their whole lives that act as a drag on the economy. I don't know if there is any single root of all evil, but a good candidate for the root of all stupidity is one-sided thinking of the sort displayed by NW in his comment. We live in mixed economies. The public sector makes up about 50% of the US economy according to economist James Galbraith. The public sector is necessary -- nothing intrinsically evil about it. China, which has shown itself to be the most dynamically growing economy in the history of world -- the biggest miracle of all -- does almost all of its banking in the public sector and about half of its production. What is needed is a good balance between public and private sectors. Fast declining US and UK have the mix strongly in favor of the private sector, so that the private sector parasitizes the public sector, arguably the worst of all possible worlds. How's it working for us? Stats don't look too good, do they. There is nothing miraclulous of China's growth, as I have written countless times, all they are doing is catching up and will likely hit a brick wall at about the half way mark (about $20k per capita). We saw with the soviet union the damage the public sector can do. Like I said it is more than just the public sector, but the whole socialist package when what we need is competition in every area of society, else the economy will DIE a slow painful death! Which is what we are observing in many western nations today. You want to kick start growth, then get rid of everything thats holding it back thats the welfare state, big government and the public sector it promotes. The public sector and welfare state are bankrupting britian which is one of the primary reasons why he have high inflation despite depression. I think you will find it's the Banks who have bankrupted Britain and when they did they were not in the public sector. Markets are boring these days...wonder ow many end up trading it just out of boredom???? which is eaxctly what one shouldn't do. 16 Jul 12, 20:44 private sector - but there are conditions surely? You've opened a big can on this one, that's for sure!! The optimal system is clearly where even for public services, we have a 'credit card' to spend where we like for a service in a competitive world. If the world was about TVs it would be a perfect world. The problem is clearly that the private sector becomes parasitic with little encouragement, particularly where it's not possible to have as many choices as for buying TVs or cameras. Health care is like that. You can't have a wide choice of niche or specialist areas and even routine services end up operating like a cartel. Just like the banks. Then there's the lobbying. A stupidly large percentage of lords lobby for the finance industry, even offshore tax havens. So the real question is how you stop the private sector becoming as parasitic as it always does. There's nothing to really keep them honest as we are reminded on an almost daily basis. G4S ignored qualified security personnel because it could make more govt money training fresh candidates. And so it goes on. Everything you refer to is the subversion of the free market private sector by the government which in effect turns them into public sector entities subject to unlimited tax payer bailouts. That is not the private sector, that is pseudo public sector. Private sector must have a mechanism for those that cannot compete to go bust, for capital and resources to be reallocated. That is capitalsm ! Not what we see today! Which is why we are doomed economically to die a slow death until the next Maggie Thatcher comes along to apply commmonsense. Labour Bankrupted Britain by bailing out the bankrupt banks. They should have let them go bust, this is nothign new for I have been consistent in my point of view for many years if not decades. Perhaps a decade from now, people will know the truth and point the finger firmly at Labour in the UK and Bush in the US. You are not going to grow the economy by turning the private sector into a pseudo public sector. Which is why I KNOW all the government can do is to print money and inflate, nothing else. The biggest test of an econcomic system comes during the bust, how they handle the bust, the more socialist the response the weaker will be the recovery.